Jennys Beauty Salon is West Lothians best kept secret.. Established since 1998, Jennys is nestled in the quiet conservation village of Livingston. A quaint and picturesque place with parking available right ouside our front door. All our therapists have at least 4 years experience and we all specialise in different areas. So please ask us who would be best to assist you. 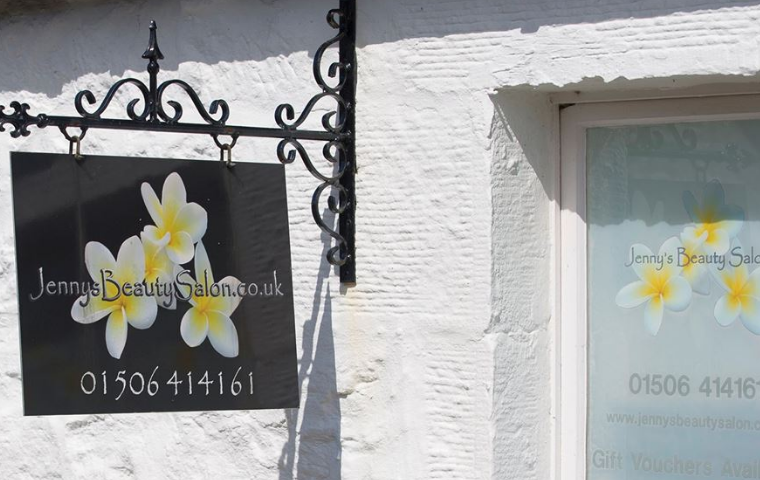 Our salon has a warm and welcoming atmosphere with a friendly smile. Please feel free to contact us online, by phone, email or facebook, with any queries you may have. We specialise in waxing, nails and electrolysis. We also cover spray tans, eyelashes, massage, hot stones, reflexology, pedicures, gel nails and toes and much more. Excellent care from both Lynne and Nicola. Friendly, efficient service. Would definitely recommend. I've visited Jenny's on several occasions over several years. Nicola, Bethany & Lynne have always been really professional, friendly and have offered high quality treatments. They are very thorough and I always leave feeling happy & relaxed! Nicola made me look fabulous .... thank you !! Very happy customer !! Had a great experience at the salon getting my nails done. Friendly ladies and great service. Definitely return and would recommend to anyone. Nicola Bradbury is very talented, professional & personable at all times. I love Nicola sorting my shellac nails every 2 weeks & she always has an array of choice & colours for me to choose. I would also like to point out that I have Multiple Sclerosis & find both Nicola & the Salon very accommodating. I had a back, neck and shoulder massage today, it was amazing I was so relaxed, would recommend to anyone. Love my monthly masssage from Lynne! Brilliant salon fabulous staff! Always a pleasure going to Jenny's Beauty Salon The ladies Nicola and Lynn are such lovely women, they never disappoint when I go to get my eyebrows done, quick and efficient. Recommend to any of my friends or family relatives. One of the best and most relaxing massage sessions I have had. Well worth it and will be back soon for another session. Love love my lashes, youve done an amazing job. Not the greatest having anything done with your eyes but Nicola made me feel very comfortable and relaxed. I will defo be back in 6-8weeks. Went for a massage with Lynn. Excellent! So good I made an immediate booking.